How To Create Express HTTPS Server With A Self-Signed Certificate is today’s leading topic. If we need start our node.js server on node.js then to be able to serve a site on HTTPS from localhost you need to create a self-signed certificate. The self-signed certificate will be enough to establish a secure HTTPS connection, although browsers will complain that the certificate is self-signed and as such it’s not trusted. It is still great for development purposes. Let us say, if you are working with React Native or other iOS development then you need an API point, and if the API point is served via HTTPs then it will be straightforward otherwise it gets complicated to get the response from the server. I have found very painful while developing frontend and backend apps. So it can be beneficial in these scenarios. Okay, first you must have installed the OpenSSL installed on your machine. If not, on a Mac you can install it using brew install OpenSSL if you use Homebrew. Otherwise, search on Google “how to install openssl on ”. If you want to upgrade your current OpenSSL version, then update the OpenSSL using the following command. Once an OpenSSL is installed, hit this command. You will prompt for some answers. Give the answers one by one. That’s it! Now you have two files in the folder where you ran the following command. server.cert is the self-signed certificate file. 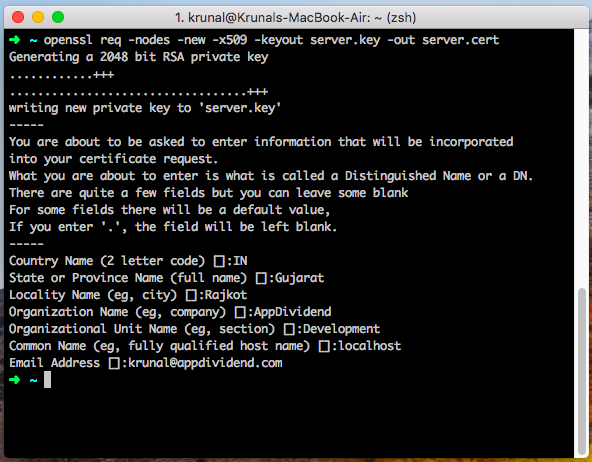 server.key is the private key of the certificate. Both files will be needed to establish the HTTPS connection, and depending on how you are going to set up your server, the process to use them will be different. Those files need to be put in place reachable by the application; then you need to configure the server to use them. This is an example using the https core module and Express. Now initialize the package.json file using the following command. Okay, now install the express using the following command. Okay, finally our code with the certificates is the following. Save the file and go to the terminal. Go to the browser and hit this URL: https://localhost:3000. At first, it will say, it is insecure because it is self-signed but ignores this error, and now you can access the content. The looking is not great on the browser because it will say insecure but trust me for a local developing purpose; it is excellent. Finally, How To Create Express HTTPS Server With A Self-Signed Certificate tutorial is over. Thanks for taking.